The WCET website has published mobile-learning blogs written by Walters State's Dr. Lori Campbell, Dr. David White and Kevin Fowler. WCET is a cooperative for educational technologies that brings together colleges and universities, higher education organizations and companies to collectively improve the quality and reach of e-learning programs. The Tennessee Board of Regents (TBR) system consists of 46 institutions with a combined annual enrollment of over 200,000 students, making it the nation's sixth largest system of public higher education. TBR's six state universities, 13 community colleges, and 27 technology centers offer classes in 90 of Tennessee's 95 counties. The TBR system is $2.2 billion per year enterprise. The mission of the Tennessee Board of Regents system is to educate more Tennesseans in order to provide Tennessee with the workforce it needs for sound economic development. Our technology centers are exclusively focused on workforce development, which is also a major emphasis in our community colleges. The latter also provide degrees designed for transfer to a university. At our universities, the priorities are student preparation and research, with five of our six universities granting doctoral degrees. Mission: To explore mobilization and emerging technology for increasing recruitment, retention, and graduation rates and to improve teaching, learning, training, and workforce development. This smaller, ad hoc group is made up of IET, IDT, the Natural Science Dean; Mathematics Dean, the Assistant Dean for Online Education, the Interim Director of the Claiborne County Campus and the Assistant Dean for Library Services. This group resolves issues, investigates technical and instructional overlap, directs technical changes and implements processes for faculty as indicated by the work of the WSCC College-Wide Mobilization Task Force. 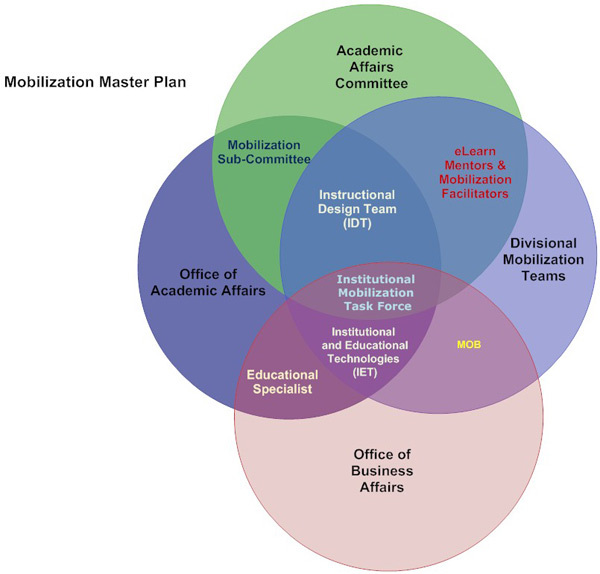 The Office of Academic Affairs developed the Academic Affairs Division Initial mobilization and Operational Plan. This document provided a written framework to develop mobilization plans for eight academic divisions. As faculty members write their individual mobilization plans, their own plans for classroom and instruction must support the written divisional mobilization plan. The Instructional Design Team (IDT) plans, coordinates, and delivers training in teaching and learning technologies for faculty (and in some instances, staff) at Walters State. As mobilization began at WSCC, IDT began working in supporting mobile learning with faculty members, divisions, deans, and committees across the college. In cooperation with a representative from Instructional Educational Technologies (IET), IDT developed a process for cataloguing, inventorying, and distributing mobile devices. During summer 2011, IDT began offering "train the trainer" sessions to the academic deans and selected eLearn mentors. In this training, academic deans and select eLearn mentors received training connectivity, operation, maintenance, interaction, app requisition and procurement system, peripherals, selection of discipline-appropriate apps for instruction, and writing a department/division mobilization plan. As mobile learning began to spread across the campuses, IDT now also works with eLearn mentors, the mobilization subcommittee, and mobilization facilitators on issues surrounding mobilization. Instructional and Educational Technologies (IET) provides the information technology (IT) infrastructure of the institution and allows academics to test these revolutionary classroom technologies and adapts this infrastructure to our needs. Notable among the changes in IET to create a robust mobile learning environment and increasing technology use among faculty is the addition of an educational technologist whose major function is to interface with faculty members and their IT needs. The educational technologist also works with IDT to understand the IT demands of the technologies, including technologies for mobile learning, and how those effect what faculty desire to do with classroom and office technologies. eLearn mentors are faculty members selected by division deans on the basis of their knowledge of the college’s learning management system ( LMS “eLearn”); their willingness to share this knowledge with other faculty; and their skills in acting as a first line of contact with faculty, eLearn, and the IDT. Many of the technologies of mobilization interface with our LMS, our digital devices work with the LMS. Knowledge of the LMS provides a foundation for using the technologies of mobile learning. eLearn mentors also initiate, plan, deliver, and assess training with faculty members. IDT members work closely at all campuses with eLearn mentors. The charge of the Mobilization Subcommittee is two-fold: to foster and encourage mobilization among faculty members and to assess the changes mobilization brings about. The committee consists of one faculty member from each academic division and one staff member representing support staff in Academic Affairs, staff members from IDT and IET and the Dean of Distance Education. The Mobilization Subcommittee receives,reviews and approves requests revision to individual faculty mobilization plans after- approval by the academic deans. Recent initiatives from this group include the Mobile Learning Fellows program and the mobilization webpage assessment database on the WSCC intranet. These selected faculty members within each division implement training in mobilization, communicate emerging trends (technologies, equipment, software, apps) and instructional strategies (presentation apps, testing apps, classroom demonstration lessons) to faculty members within their own discipline areas. Mobilization facilitators are appointed by division deans and work closely with IDT on creating training, articulating faculty members needs around mobilization, and represent mobile learning to all members of the department, and wider institutional audience.